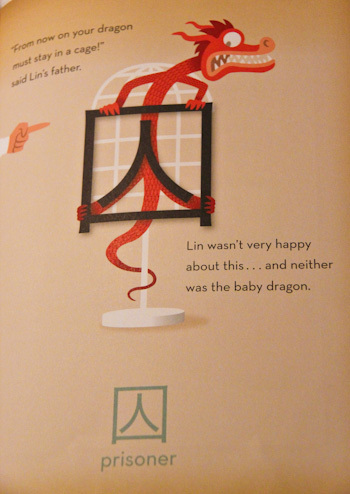 Christoph Niemann’s The Pet Dragon is an excellent introduction to the pictographic elements of the Chinese alphabet. 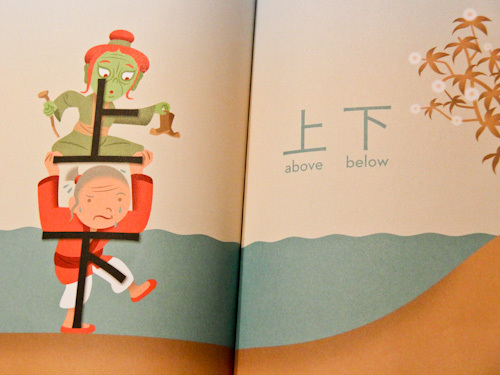 Although it’s a simple story, the illustrations demonstrate 33 Chinese characters that are related to the physical attributes of the word they convey. It's a story about adventure, friendship and Chinese characters. Right from the start of the story, Niemann makes a graphic correlation between the characters and the words. As a graphic designer, one of my professional inspirations is Christoph Niemann who demonstrates an artistic versatility and cultural wit in his work which is regularly published by the New York Times. I’ve followed his career for years and knew about this book when it was first published in 2008. Soon afterwards, I sent it to my sister’s family in Hong Kong to assist in their cultural appreciation of the Chinese-language characters around them. 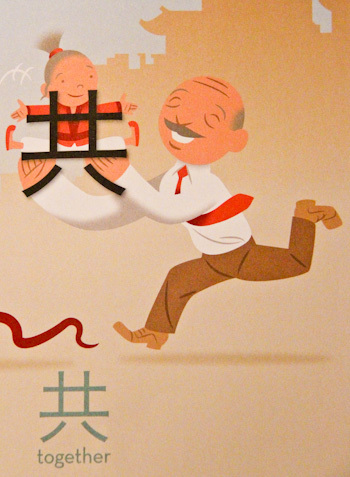 Chinese pictograms start to take a more obvious meaning. Hopefully, once we're familiar with the characters in this book, we'll start to recognise them outside the book too! 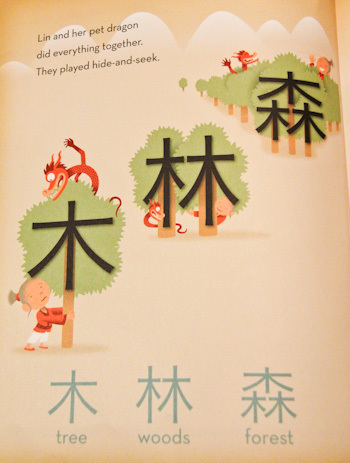 The book lacks a pronunciation guide, and Niemann has expressed that he didn’t ever mean for The Pet Dragon to be an introduction to Chinese. Instead, he wanted to illustrate the connection between the pictograms and their meanings, whetting the readers’ appetite to learn more of the language through other sources. With the help of Niemann's illustration, the design of words like "above" and "below" become meaningful. The Pet Dragon also serves as a fantastic introduction to the wider ideas of hieroglyphics and other cultures that use pictograms or non-Latin characters. J.R.R. Tolkien created his own Elvish characters for Tengwar, and my girls have loved making up their own secret writings as well. Especially for visual learners, this book will be very helpful in learning 33 common Chinese characters. We’ve been preparing for our trip to China for months. Originally we were going to visit our extended family who reside there, but in the last month they’ve relocated elsewhere. However, our family’s recent immersion in Chinese-language programs, stories and books means that although our time in Beijing is now cut short, we’ll be able to appreciate more of the cultural aspects of the world’s current super-power. 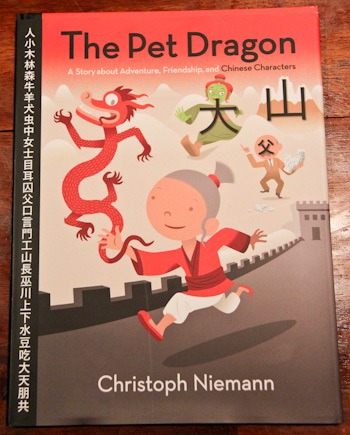 Perhaps because of Niemann’s celebrity, The Pet Dragon remains widely available online and in bookstores. It’s great for any household with an interest in design, languages, Asian culture or travel. Thanks for this book resource, Hannah is taking a Chinese class and this will fit right in. Looks like a great book! Thanks for the review. Lauren, I just have a quick question. I know you don’t do sponsored posts (which I completely understand, though would not mind if you did) but I was wondering if you’d consider Book Depository affiliate links for books that you review? I often search for reviews of books that I’m thinking about buying or am introduced to books that I haven’t previously heard of, but look interesting, via blogs like yours. If I decide to buy them I usually try to use an affiliate link on a blog, sort-of as a way of thanking the blogger for writing a helpful review. Another option that I’ve seen on some blogs is having a non-affiliate link and then underneath having an affiliate link, so people can choose which one they use. 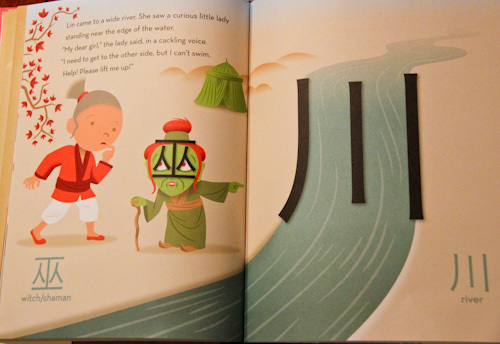 Just a friendly tip, that book appears to use traditional characters. They won’t all be of help in Beijing, since China uses simplified characters. Most of them are the same, but some are quite different. Also, Mandarin doesn’t have an alphabet nor pictograms but does have characters. Learning Mandarin (or Cantonese since you mentioned Hong Kong) is so much fun and useful, though.